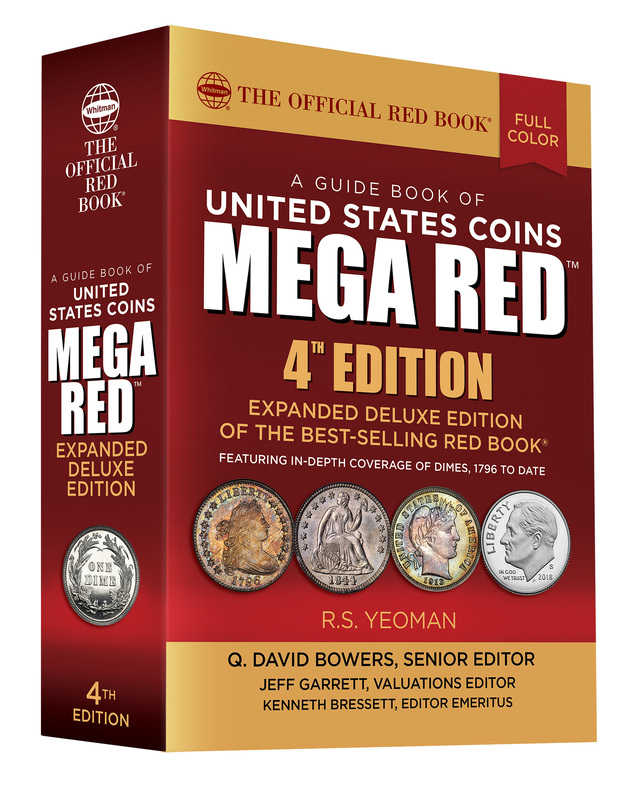 (Pelham, Alabama) — Collectors of exonumia (tokens, medals, and similar coin-like objects) will enjoy more than 50 pages devoted to their interests in the fourth edition of MEGA RED (the Deluxe Edition of the Guide Book of United States Coins). Eight of the book’s twenty-five appendices feature American exonumia ranging from dime-sized tokens to dollar-sized and larger medals. The 1,504-page MEGA RED is available from booksellers and hobby shops nationwide, as well as online (including at the publisher’s Web site, Whitman.com). It retails for $49.95. So-Called Dollars: Appendix G, written by Jeff Shevlin with additional research by Bill Hyder, is an illustrated 16-page feature on the So-Called Dollars of the 1915 Panama-Pacific International Exposition, with historical notes, specifications, rarity ratings, and valuations in nine grades. Dimes in American Popular Culture: Appendix H, by Joel J. Orosz, is a nostalgic stroll down Memory Lane with dime-related materials ranging from song lyrics to pulp magazines, plus political and satirical encased dimes, shell cards, tokens, related numismatic ephemera, and more. 9 pages. Advertising on a Dime: Appendix K, by Bowers, focuses on advertisements and political messages counterstamped on U.S. dimes; plus Civil War–era encased postage stamps of the ten-cent denomination. 6 pages. Civil War Sutlers’ “Dime” Tokens: Appendix O, by Bowers, is a showcase of ten-cent tokens issued by licensed retailers known as sutlers, who typically traveled with Army troops during the Civil War and supplied the soldiers with goods. 3 pages. Civil War “Dime” Store Cards: Appendix P, by Bowers, illustrates Civil War tokens issued to be redeemable for 10¢, standing in for the nation’s silver dimes, which were hoarded out of circulation by the summer of 1862. 2 pages. Dimes as Planchets for Civil War Tokens: Appendix Q, by Bowers, explores rare silver tokens, struck over federal silver dimes, issued as numismatic collectibles during the Civil War. 2 pages. Irradiated Dimes: Appendix U, by Bowers, is an illustrated study of Barber, Mercury, and Roosevelt dimes irradiated in isotope cabinets and encased in souvenir holders in the 1940s, ’50s, and ’60s as educational examples of atomic energy. 3 pages. Modern U.S. Mint Medals: Appendix W, by Dennis Tucker, is an 11-page overview of bronze, silver, gold, and other medals struck by the United States Mint since the Bicentennial celebrations of the 1970s, including Congressional Gold Medals, World War I and World War II commemoratives, silver Presidential medals, and others. The fourth edition of MEGA RED has a special focus on U.S. dimes with a 294-page feature section covering ten-cent pieces from 1796 to 2018, with more than 1,600 dime photographs and a study of 845 varieties. Images are from the Whitman Publishing historical archives plus coins photographed by Heritage Auctions, Stack’s Bowers Galleries, NGC and PCGS, the Smithsonian, and individual hobbyists who answered Whitman’s call for dime photographs. MEGA RED is billed as the “biggest, most useful Red Book ever.” It measures 7 x 10 inches and has 1,040 more pages than the regular edition. The larger size and increased page count combined make MEGA RED five times bigger than the regular-edition Red Book. It prices more than 8,000 items in up to 13 grades each, with 48,000 individual values and more than 15,000 auction records covering circulated, Mint State, and Proof coinage. The book is illustrated with thousands of full-color images, including thousands that are new to this edition. MEGA RED is available from booksellers and hobby shops nationwide, and online.